Cohen – A Tribute is an exploration of the life and works of the late Leonard Cohen. It features his music and poetry interspersed with anecdotes from his life and other literary writings. You can expect early hits such as Suzanne and So long Maryanne, the haunting Famous Blue Raincoat and Who By Fire? There will also be lighter works such as Tower of Song as well as pieces from his final album You Want It Darker? which was released just before his death. The text for the show was researched and written by Perran Hahndiek and is performed by Dave Starke. Perran Hahndiek is a writer and poet based in Cape Town. He studied political science at UCT and is a procedural advisor to the National Assembly in the South African Parliament. 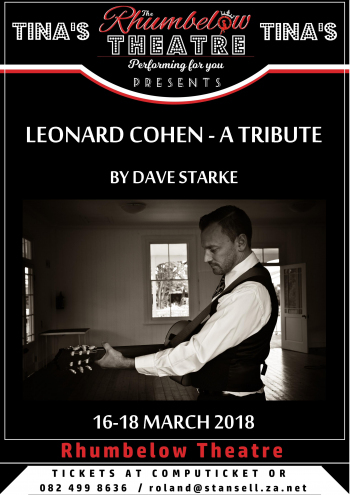 Dave Starke is a singer and guitarist based KZN. He has performed in a number of festivals and shows throughout South Africa and abroad over the last 20 years. In 2016, he appeared on the first season of The Voice – South Africa. In addition to performing, Dave also composes music for film and television as well as running a non-profit performing arts school for underprivileged youth in southern Zululand. Tina’s Hotel is situated at 4 Beryldene Road in Kloof.